This page provides a range of solutions and tools tailored to your marketing objectives to maximise your leverage on the wanita.netTM Network. With the Internet as the fastest growing medium ever, wanita.netTM Network lets you interact real-time with your audience. The right audience at the right time. wanita.netTM Network can offer advertisers, merchant and direct marketers with advertising, programming and placements ideally suited to their advertising objectives. 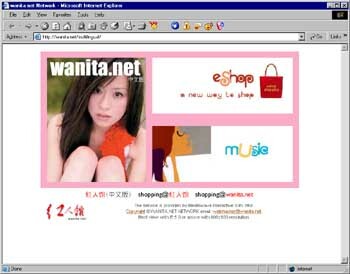 Over 1 million page view and 65,000 unique visitors of wanita.netTM Network each month, the web site provides advertisers, direct marketers and merchants with targeted access to women and youth using the World Wide Web. Learn more about how digital advertising work. Learn more about wanita.net Network. Contact a Digital Advertising Sales Representative.